My first-ever Podium Finish at a TRIATHLON! At the Hero Triathlon (Olympic-distance) on Cape Cod. My first-ever Podium Finish at a TRIATHLON! At the Hero Triathlon (Olympic-distance) on Cape Cod in Mashpee, MA. I entered my first triathlon in 2005. In the next few years I ran half a dozen Olympic-distance Tri's and perhaps three times that many Sprints. But I never won an award. Never even imagined the possibility. 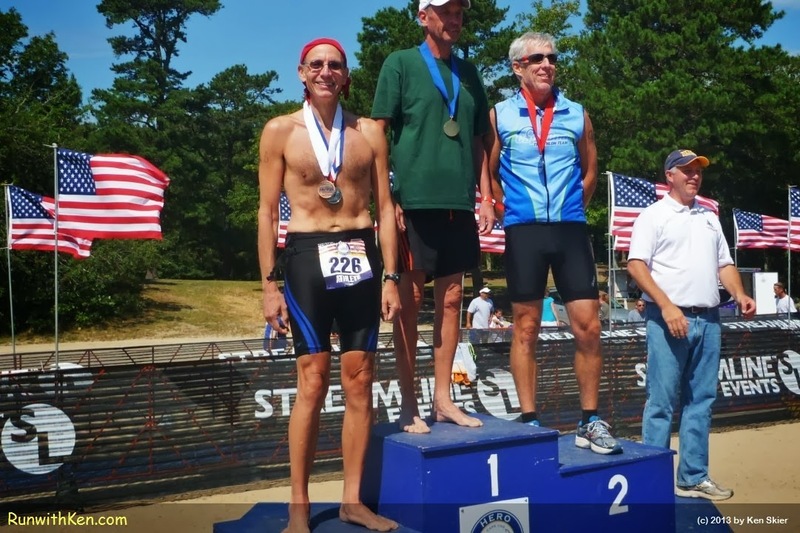 Today, however, at the Streamline Events Cape Cod Hero Triathlon, I heard my name on the loudspeaker and was called up to the podium to receive an award as 3rd-place finisher in my age group. What a surprise! I did not swim, bike, or run for speed. I swam with a camera and took photos of the other swimmers; I biked with a camera and took photos of the other cyclists, and of course I took photos of the other runners as I ran. My goal was not a finish time, but great photos from "inside the pack" that I could publish as Run With Ken. Nevertheless, I swam, biked, and ran as fast as I could. And apparently that was fast enough to earn me a medal!